Aral Balkan: Historical Archive — New SWX Tutorial: How to get the list of 100 most recent Flickr photos into Flash with SWX RPC. 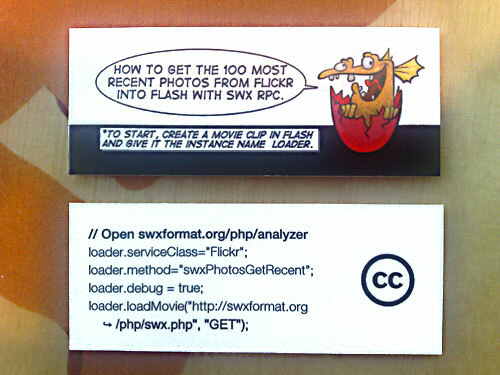 New SWX Tutorial: How to get the list of 100 most recent Flickr photos into Flash with SWX RPC. Historical content: I wrote this article over 9 years ago on 2007-08-17. You are viewing an archived post from my old WordPress blog. The archive contains over 1,600 articles written over a ten year period. The formatting and contents of the posts may not display perfectly. I just received the new batch of Moo cards that show you how easy SWX is to use. And just how easy is that? So easy that the instructions fit onto a Moo card, of course! 'Nuff said. Update: In the latest set of cards, I've changed the back a bit. I've removed the CC logo to make room for a bit more text (for better formatting) and made all lines except the first one boldface as using the continuation arrow (RIGHTWARDS ARROW WITH HOOK in the Character Palette on OS X) makes the last line boldface in any case. Note that the text above will not fit if you use the CC logo. PS. I'm really happy with how the cards turned out but, unfortunately, there's a bug in Moo's card creator that resulted in the last line of code coming out in boldface when it shouldn't have. I'm going to tell them about it now. I submitted bug reports for this and another issue I encountered and apparently they are both known issues. I hope that Moo addresses this issue, at least, as it affects the end result quite substantially. Looks great! Pretty funny too, to make a tutorial based upon you moo cards! Great! hello aral! this swx stuff souds great. Just a quick questions, in real world (thousands users) how swx behaves with bandwidth and server cpu process compared to amfphp or webservices techs? Hi bong, The only implementations of SWX RPC are currently in ActionScript 2. That's really great that you got your tutorial to fit on a business card. Too bad I couldn't make it work! Is swx is actionscript 3.0 or 2.0?